Searching for traditional Ukrainian vegetarian cabbage rolls, I have opened my grandma's legacy - her calligraphically handwritten notebook pages, yellow from the time passed and falling apart from many uses, and her cook books. When I turn the pages of old Ukrainian cook books, one pattern emerges - many recipes in them don't include meat. No wonder, as the Ukrainians did not eat meat every day in the old times. Simple plant-based dishes filled with grains and veggies, with addition of sour cream and dill is what you could expect to be served in the Ukrainian countryside. Homemade bread from the clay stove would accompany every meal. 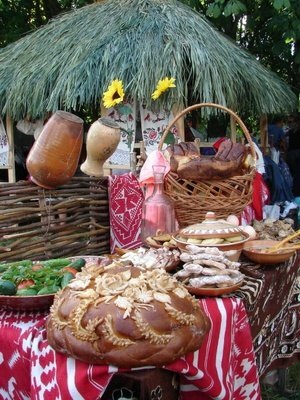 Ukrainian cooking tradition places great emphasis on how palatable the food is. Without adding distinct spices that overtake the meal, a Ukrainian woman creates dishes where tastes are subtle, but not bland, and they work well together as an orchestra of which she is the conductor. And so these Ukrainian vegetarian cabbage rolls, or Holubtsi [ho-lub-tsi, with stress on the "tsi"], are simple, filling, and savoury. I will post several traditional types of filling for the Ukrainian holubtsi. There is another page on my site describing the detailed process of making cabbage rolls . I will only post recipes for vegetarian cabbage rolls filling here. If you want the healthiest low fat high protein version, my own recipe for vegetarian cabbage rolls is on its way. Trust me, I worked hard to make it taste as close to the original rice-meat recipe as I possibly could. Boil the water and add washed rice to it. Stir well. Meanwile, heat the pan, add butter or oil and, when it is hot, add an onion. Cook until golden and season well with salt and pepper. Make sure it tastes overseasoned as cabbage will absorb some of this taste, leaving the filling taste bland. Cook the rice in equal portions of water and tomato sauce. Tomato makes vegetarian cabbage rolls particularly enjoyable. 2. Mushroom filling: Cook 1-2 cups of chopped mushrooms together with the onion. 3. Rice with herbs: Add 1/4 cup dill, 3 chopped garlic cloves, and 1/4 cup parsley to the cooked rice. Making buckwheat filling for cabbage rolls goes back in centuries. I know, buckwheat is not something North American humans would particularly think of enjoying. 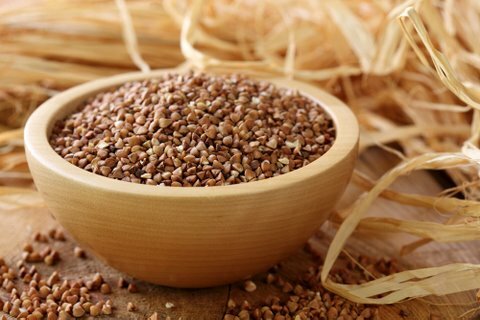 Buckwheat is the food for livestock here, but in the Ukraine and Russia this grain is more popular than rice. If you look at the officially monitored consumer's food basket, buckwheat is right up there in the top three with bread and eggs. I dare you to try roasted buckwheat. It's good for your heart, and for controlling your blood pressure and blood cholesterol. It is gluten free. Just like poultry, it contains tryptophan, the hormone that makes you happy (at the very least, it works on the Russians and Ukrainians!). Make sure to use roasted buckwheat for this recipe, it is brown in colour. It is sold at the bulk food stores and Eastern European stores as well. If roasted buckwheat is not available, it's easy to roast green buckwheat in the oven. In a deep skillet, heat the fat, add buckwheat groats, stir, and brown lightly. Make sure to not deep brown or scorch. Just lightly toast that buckwheat. Add water or stock, salt, bring to a boil, cover, and cook in the oven for about 30 minutes, or until the liquid is absorbed. Buckwheat, just like rice, needs to be partially cooked for the holubtsi. Fry 1 onion and 2 cups of mushrooms and mix with buckwheat. If you want to make variations, beware that buckwheat doesn't go well with tomato. I hope you enjoy these really old authentic recipes for vegetarian stuffed cabbage rolls. Next I will post my own vegetarian cabbage rolls recipe that my family was astonished with. I hope you will try my other easy cabbage recipes, and get persuaded that using more cabbage more often is good for you. Cabbage is cheaper than goji berries and other antioxidants, and it's effectiveness for cancer prevention and weight loss is proven in studies. Enjoy!